I made this handbag cake from a rectangle cake, which I cut and layered. I then froze the cake and once frozen I carved the shape. For the board, I covered in icing as normal. I then got a stencil and painted Trex and silver powder to make the flower shapes. I impressed my friend’s name around the edge and covered the sides with ribbon. I put some icing sausages down the front of the bag so that when I covered it with icing it created a sort of pleated effect. 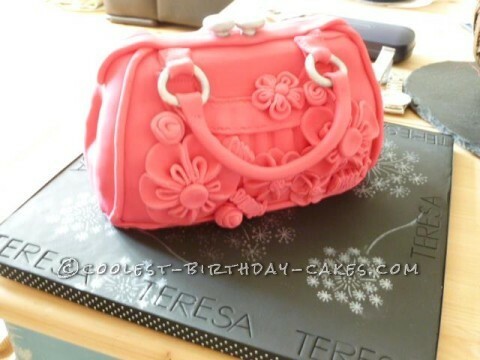 I used a sugar gun to get the piping which helped define the shape of the bag. I added handles and an edging along the top with a clip. The flowers were made using Mexican paste to help with the shape.